The sales of the nakamijiru flavored potato chips is limited to outlets in Okinawa, Kumamoto, Fukuoka, Oita, Nagasaki, Miyazaki and Kagoshima prefectures. Only one batch of the chips is made and they will be available until supplies last. Nakamijiru is traditional Okinawa soup that has been cooked in Okinawan kitchens since the Ryukyu kingdom era. It is nowadays served especially on New Year’s Day and other celebrations and notable events. Its main ingredients are pork tripe and dashi from bonito flakes. The pork tripe is treated to remove its distinct odor. Calbee, Inc. is running a campaign called “Love Japan” that started in September 2017. The campaign features potato chips with flavors from all 47 prefectures of Japan. The flavors come from popular foods in each prefecture. 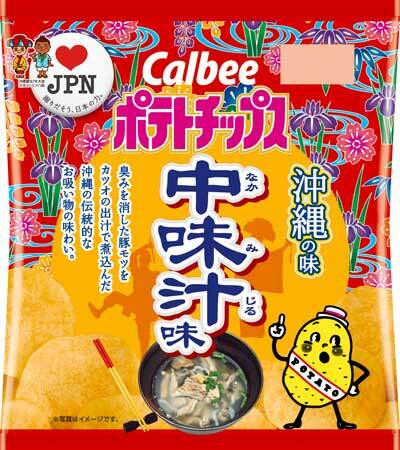 Calbee has already released wasabi flavor from Hokkaido, takoyaki flavor from Osaka and Chicken Namban flavor from Miyazaki. Shuji Ito, the COO of Calbee, said that the company started the Love Japan project because they want to promote local regions, and cheer up the entire Japan.